Defoliated Okinawa - "Island of Evil"
During the Vietnam War, Okinawa earned the nickname “Island of Evil.” Now, many US veterans are speaking out about the usage of AO on Okinawa. They sprayed it but the US government denies their accounts. 40 years later, finally documents have been found to prove their accounts. At the heart of the Agent Orange on Okinawa campaign is Joe Sipala - he was exposed on Okinawa but today is denied compensation by the US government. One day, he spilled Agent Orange on himself and it removed all the hair on his legs and caused severe skin problems. Agent Orange was used in Vietnam to defoliate jungles and today it continues to cause serious problems in that country - the Red Cross estimates 3 million people are affected. Sipala developed health problems after his exposure and his first child was miscarried. The doctor asked him if he’d been exposed to AO. His next two children suffered problems, too. When he saw Vietnamese children’s problems on TV, Sipala made the link with his own family. 132 veterans have filed for compensation with the Department of Veterans Affairs, but the US government says they have no records of AO on Okinawa. But 3 veterans have received compensation - including Larry Carlson who suffers from numerous illnesses including Parkinson’s and lung cancer. He drove AO to numerous bases. His children suffer from AO-connected illnesses, too. Although he has been receiving compensation, the US government announced that it would be severed. Carlson believes that the reason for this is simple: money. In the 1960s, Okinawa was a frontline base for the war in Vietnam. For example, there was guerrilla training in the northern jungles and B-52 bombing runs. Retired journalist, Kuniyoshi, remembers a visit from a Vietnamese university professor who said that Okinawa was, in part, responsible for the bombing of his country. In 1968, deformed frogs were found in a rice paddy in Gushikawa. 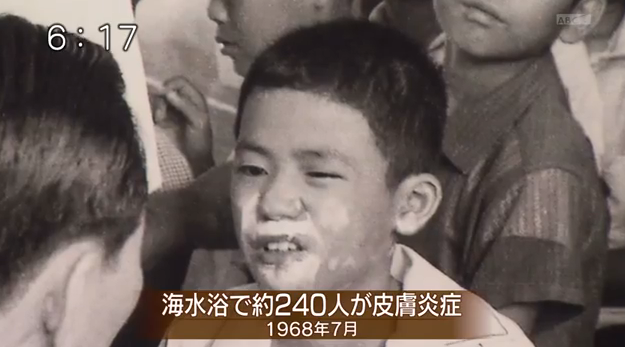 In the same area, 240 people suffered burns after swimming in the nearby sea. This occurred along the east coast at several locations neighbouring American bases. According to their teacher, their skin was damaged on their legs and beneath their armpits. At the time, it was assumed that they were injured by industrial pollution or even radiation from nuclear submarines. But now, it seems clear that not only these people were affected - also US veteran James Spencer was harmed while spraying AO at nearby Tengan Pier. Spencer says that the AO was powerful and quickly killed the vegetation. It also damaged his skin and made breathing difficult. Former base workers also were exposed. They say they had pumps and sprayed the grass. One former base worker saw an orange-striped drum on base in 1968. Its contents were used to kill the grass. He also saw it being sprayed near the beach where the 240 children were injured. The spraying also bleached the shoreline. In the early 1970s, it was announced that seaweed caused the children’s illnesses at sea - but why would this have affected the frogs in the rice paddies, too? Around this time, there were also mass deaths of fish along the shores and the illegal dumping of chemicals by the American military. Even in the 21st century, hundreds of drums were found on Okinawa. These discoveries have worried Okinawa residents. 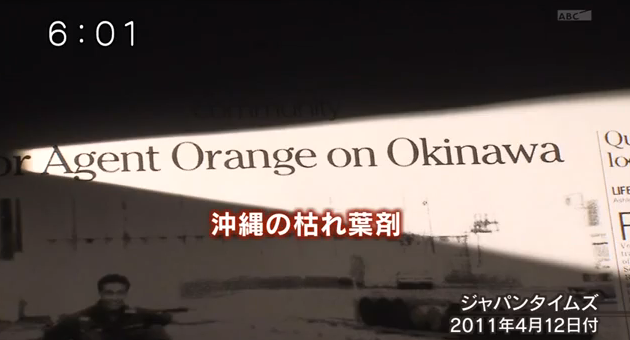 But when they took their complaints to the Prefecture, they were given the response from the US government that there are no records of AO on Okinawa and the veterans’ accounts are dubious. But now a US army document has been found that clearly states 25,000 barrels were on Okinawa. However, we don’t know how much Okinawa residents have been poisoned. According to Carlson, US veterans have been abandoned. According to base workers, their comrades have died. 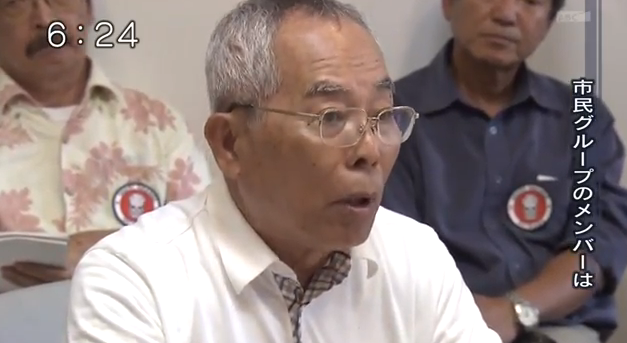 Sipala says that environmental tests must be conducted on bases and Okinawa people must take the initiative to ask their government for the truth.